The Xbox One’s new interface is a bit rough out of the gate for video viewing. Here's how Microsoft plans to make it better. I wasn’t particularly kind last month when I wrote about the Xbox One’s big interface overhaul and what it means for TV viewing. To me, the new home screen and revamped TV menu—which bears the Microsoftian title “OneGuide”—seemed like a confusing jumble of poorly explained options, half-baked concepts, and redundant features. In attempting to reinvent TV, it seemed to me that Microsoft had failed to get the basics right. I’ve since had the chance to talk over the new interface with Microsoft Xbox One program manager Richard Irving. While he defended many of the ideas in the so-called New Xbox One Experience, Irving admits that there’s room for improvement, which is why Microsoft enjoys gathering feedback from users. Irving describes streaming video as having a “Swiss cheese” problem. No single provider has everything you might want, so you must sift through a handful apps just to find something worth watching. Like many other media streamers, Microsoft partly tries to solve this problem with cross-app search. 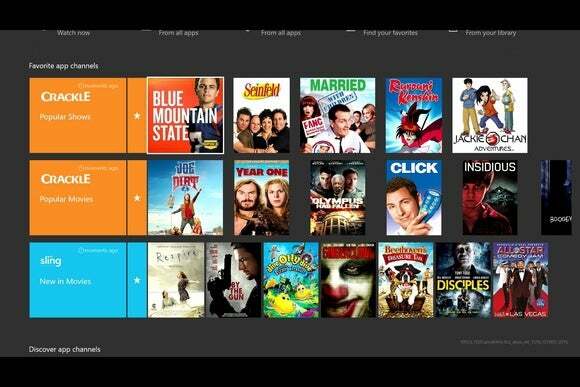 But the Xbox One also introduces a concept called “App Channels,” in which individual apps can feature some of their movie and TV options directly in the OneGuide. Unfortunately, not many apps have bothered to offer an App Channel to date, including Netflix, HBO Go, and Amazon Prime. Irving believes this will change now that Microsoft is carving out prime real estate for App Channels directly on the Xbox One’s home screen. 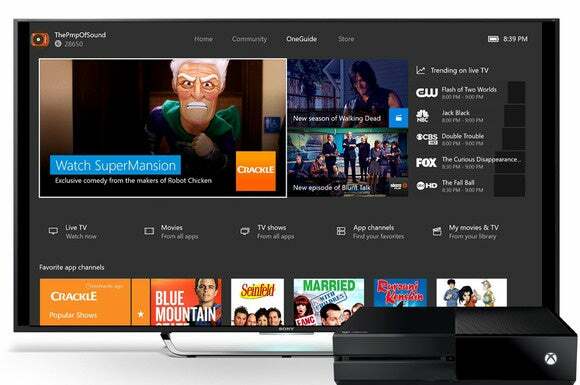 With App Channels, services like Crackle and Sling TV can advertise content directly on the Xbox One home screen. And while I criticized Microsoft for plastering App Channels everywhere—including on the home screen and within three separate menus in the OneGuide app—Irving said users have asked for even more exposure. Soon, video apps that appear in your recent-apps list will be able to display App Channel content there. Down the road, Microsoft is hoping to get smarter about what it shows you, both in App Channels and elsewhere within the OneGuide. “As deeply personalized as we can get is of huge value, both to us and to consumers,” Irving said. For instance, if you watch a lot of Seinfeld on Hulu, the App Channel for Hulu might start showing Seinfeld and related shows directly on the home screen. Microsoft also wants to tailor suggestions in its OneGuide, so its Movies and TV Shows sections will be better-tuned to your interests. While Microsoft can already do this today with its Xbox Video content, hooking in third-party apps will take time. “There’s software that we have to write," Irving said, "there’s software that our partners have to write, and so, just coordinating, making sure that we commit the time to do it and do it well, because to do it well is the important thing,” Irving said. One thing Microsoft is still working on is improved shortcuts to video apps such as Netflix and Hulu. As I wrote last month, these apps don’t appear within the Xbox’s TV menu (unless they offer an App Channel, that is). Instead, you must scroll down to your pinned apps in the main menu, or open up the master “My games & apps” menu to find them. Microsoft did think about showing a list of video apps in the OneGuide, but found that it’s a coin-flip as to whether users visit this section when they know exactly what app they want, Irving said. While the company has looked at some other ways to surface video apps, none have made much impact in terms of usage. Microsoft lent a hand to cord cutters earlier this year by offering an official USB TV tuner for the United States. Users can watch free over-the-air broadcast-TV channels and stream the video to other devices over Wi-Fi. Still, it’d be nice if Microsoft supported more tuners, especially when over-the-air DVR support arrives next year. 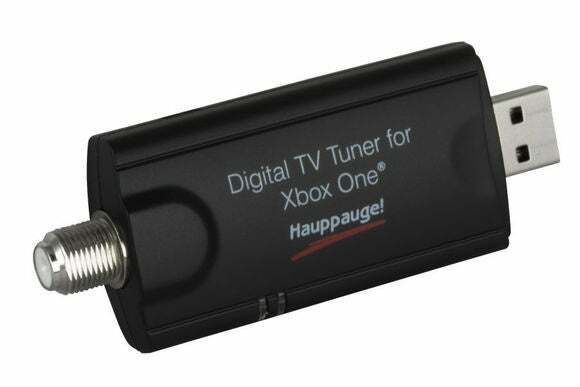 Hauppauge's $60 TV tuner is the only one Microsoft supports for now. Irving said the decision to support just one tuner was about quality control, and making sure the device works exactly as expected. But he did say Microsoft is “looking at potentially working with other tuners” in the future. Though he wouldn’t acknowledge it directly, multi-tuner devices that let you record one channel while watching another seems like an obvious next step. Some love for home-theater PCs? Near the end of our interview, I indulged in an especially geeky question: Some people still rely on Windows Media Center as the backbone of their living room PCs. The aging software was great for recording live TV, but it doesn’t work with Windows 10 and there is no modern equal. Could Microsoft bring the Xbox One’s over-the-air TV and DVR features to Windows someday? Irving wouldn’t answer directly, but noted that using Windows 10 as the basis for the Xbox One operating system makes “a lot of these cross-device scenarios that we’ll want to execute on in the future” much easier. So, no specific announcements to make, but a lot of hope and potential for the future because of this migration,” he said.